Let's face it, it is time for the church and the culture around it to grow up and face facts. Gay folks have been around for a very long time. They're not going away. They're in our families, our schools, our workplace, and yes, they are in our churches. My uncle and two of my kids happen to be gay. My family is a microcosm of what's going on in the wider culture. To tell you the truth, my family did fine with this. Years ago, we didn't talk about it much because it simply wasn't a matter for polite conversation. My grandmother simply said that my uncle was a "confirmed" bachelor. My family still doesn't talk about it much because it is a big non issue for us. But there are grown men and women in very responsible positions who are calling the LGBTQ thing a sin. They want to deny our families equal rights in the name of family values. What do you think our families are? Do you want to deny us the right to love our loved ones? Do you want to deny my children the right to love someone if they find someone special in their lives? Seriously, do you want to deny God's blessing on those God created? This book is dated now. But it is still out there and now it is in digital format so you can download it from Amazon or iBooks. 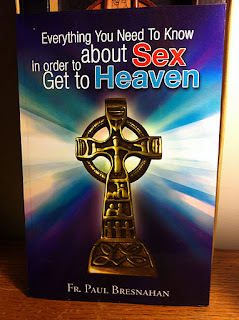 It is a bit of a whimsical and satirical romp at the church's expense. I take off the gloves and hands out some good jabs and jibes at some politicians...and that was before the current crop. I never thought I'd say this but George W. Bush is beginning to look good compared to the the amazing collection of mugwumps and scalawags that the Republican Party is parading out there on the stumps right now. She loved my uncle very much. He was her son. She loved his partner of more than 50 years. She would have loved my children too, had she lived to see the day. But more than her, I miss her kindly generous spirituality. She was also a fierce defender of her family. So I wrote this book. I invoke her spirit. I fight fiercely for my family. I am proud of my church that it is grown up enough to face facts, albeit with mixed feelings and in a somewhat awkward way. Heaven is not far away. Heaven is at hand. It is in the love we bear for one another. So lets face facts, and grow up and live in a kinder gentler kind of way. There I go quoting another Republican! It is much later in the day than sunrise, but the glorious light just broke though the clouds. I can remember like it was yesterday, how my grandmother would run around the house, it seems, opening the curtains and exclaiming "Look at that Glorious Sunlight!". I capitalized those words because that's how she said it. So here we are, yet another day, and a few words began to emerge from my spirit and my soul. My memory began to knit a few thoughts together and then they all came into place when I looked them up. These folks have gone fishing. They are common folk. There were political revolutionaries, a tax collector or two, some prostitutes, and a kind of rag tag group. They were all sinners of one sort or another, and not at all admired by the upright ones of the Temple. It was the likes of these that changed the world. Long before these folks there was Jonah; he was told to go to Nineveh that great city and tell them to knock off their sin and corruption. He went the other way in defiance of what he knew was better, and went through an unfortunate episode with a big fish. He decided to pray from the belly of the whale and lo and behold, there was an upset tummy and he was spit up onto the shore. Finally he did go to the great city. He gave them fair warning. They listened to him and repented of their evil ways and then, as the story goes, God repented of the evil he had intended to do to them. For some reason Jonah got angry with God because of this success but there you go. The encounter with God is never easy. 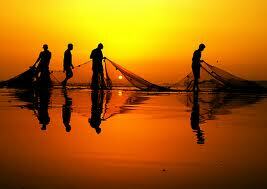 The fisherfolk encountered the Love of God made flesh and blood, and came to know him as Jesus. It seems so simple as we read the account of the call. "Follow me" is all he said, and they followed. They were not vetted, examined or educated in any way. He invited them. The followed. My experience of call came out of those long and sleepless nights when I was a child wondering about what happened to my dad when he died. The trauma left me often sleepless fearful of nightmares. It came to me in the silence of my heart. "Don't you know there's a special place in my heart for your dad?" The question came from the conversation I often had with the silence in my soul. The silence became a Presence somewhere along the way. And when I heard the question the Presence gave me, I exulted like a child playing in the waves at the ocean's edge. And I decided to become a Priest. 39 years later, I wrote this prayer of Self-Dedication. It speaks of the Silence that became a Presence to me. In that Silence, I found God. And not long afterward, the Love of God made flesh and blood found me. We call that name Wonderful, Counselor, The Mighty God, The Everlasting Father, The Prince of Peace. And then do I remember God. I discover that God is there within my heart. God heart moves in mine and dispels the fear. Here and I dedicate myself to Jesus. Jesus had a new idea. 'I give you a new commandment, that you love one another. Just as I have loved you, you also should love one another. By this everyone will know that you are my disciples, if you have love for one another.’ ~John 13:34. This he said shortly before he was crucified. He thought that this would be the Way and The Truth and the Life. Perhaps if we could just Love One Another. He said that no one can come to the knowledge and love of God unless we do love one another. It amazes me that Christians have used this one glorious sentence to play a game of spiritual exclusivity and one upsmanship as if the use of the syllables that constitute the name "Jesus" would suffice to secure the path to salvation. Jesus made it much simpler. Love one another. Nothing more, nothing less. That's what it is to be a follower of Jesus. Mind you there are lots of non followers who do the same. They too are the Way, The Truth and the Life. I have a new idea; "Love one another". Allow me to share these words with you in honor of Dr. Martin Luther King. And above all for your son Jesus Christ, for the gift of his life, for the forgiveness of sin and the gift of eternal life, for his compassion and love for all without regard to orientation, gender, class, race, ethnicity or language and for his command that we love one another, may Jesus’ church become and remain “A House of Prayer for ALL People”; Lord, in your mercy, hear our prayer. 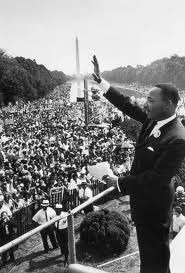 Celebrant; We thank your for your servant Dr. Martin Luther King who led your children to become free at last, Grant that your church, may make no peace with oppression, but raise up prophets in every generation, so that we may come to love and respect the dignity of every human being. This is such a difficult time of year for so many people. All these images of joyful people gathered with their families, with smiles written across their faces, and full of radiant happiness; all of this can be difficult for those who do not share in the joy. In my line of work, not only do the joyful gather on Christmas Eve to celebrate the Most Holy Night of the year, many also come to my office to pour their hearts out over great, deep and insistent depression. I was working on the phone with someone not all that long ago, a young man in his twenties. He was so despondent that he was in fact wondering how to go on the way he was. Life had become close to hopeless and the prospect of living many more years this way was becoming overwhelming. "Have you forgotten how to love?" I thought of a plant or even a goldfish. Anything. Something. Fear began to take hold, when I thought to ask the question again. "Imagine a baby, it is cold and the baby is alone. The baby has no home. His mother is very young and unmarried. They are poor and they are homeless. Would it be possible for you to pick up that child and give him some warmth and human affection? Or would you leave the baby there unloved?" Yet I insisted on an answer. There was a voice on the verge of tears that said, "Of course I would pick up the child". So then, there was another long silence. "Would you embrace the child?" Could you love the child?" "The Child is You", I said. "This is why we have Christmas. It is to remind us that the Holy Child is YOU! You may notice that you are sometimes cold, far from home, alone, and uncertain about your future, poor, despondent. Yes, that is why The Child was born in that cold, stable, of an unwed Mother. He came into the world to remind you that you are invited to pick up the Child in your own arms, to enfold him with your own warmth and love. But this is the greater lesson of Christmas. The love of that Child is not just for God or his Son Jesus. That love is for all of God's children, rich and poor alike, male and female too, all races and ethnicities and yes friends, for gay folks as well as for the rest of us." 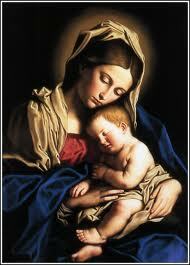 "The Holy Child of Bethlehem, you see, is not someone from a long time ago and in a faraway place. That Holy Child is YOU!" Thus I spoke that night with a loved one. Thus I speak with you. Remember to love the Child of Bethlehem within you.